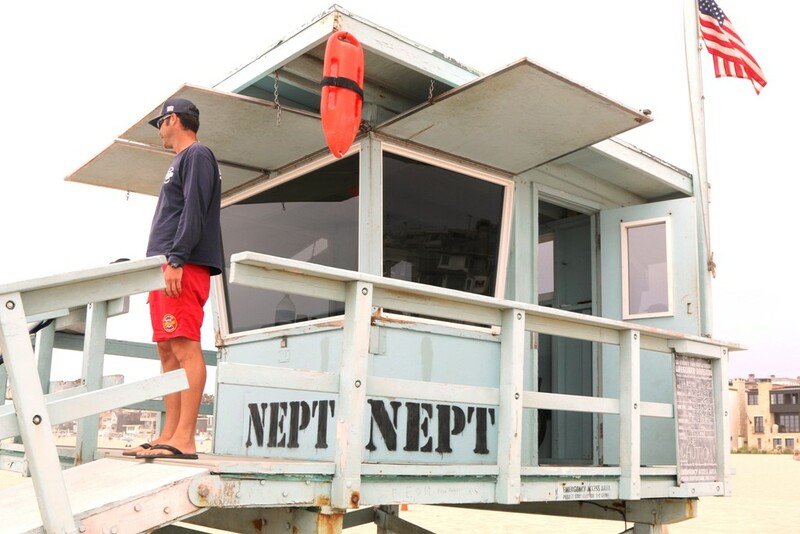 Los Angeles County Lifeguard Patrick Volosin watches the ocean from his twice renamed lifeguard tower on the border of Hermosa Beach and Manhattan Beach. For decades the tower was named Neptune, after Hermosa’s name for the street the tower stands in front of. Last winter, the lifeguard department renamed the tower 1st Street, after the name Manhattan Beach gives the same street. (The street sign on the Hermosa side says Neptune Street. On the Manhattan side the street sign says 1st Street). The name change was made to make the tower easier for county emergency dispatchers to locate, according to a lifeguard spokesperson. One recent morning, surfers who have long met at the tower to check the surf, discovered Ol’ Father Neptune had reclaimed title to the tower.